The Bug had a minor surgical procedure done to remove a mole/birthmark she has had since birth. It had recently changed texture and the edges were becoming more jagged, so it was best to have it removed. It was also in a...shall we say...peculiar location. Her dad and I used to say if any boys were overheard speaking of her birthmark, the boy was dead and she was grounded. Now she has a nice long scar. Actually the surgery was performed by a plastic surgeon in an effort to keep the scaring to a minimum. I think the surgeon did a great job. But as I sat there in the waiting room, while the doctor cut my daughter's coochie area with a scalpel, and I began to question myself as to why I insisted I would be okay in the waiting room alone. I also questioned why I agreed to have her surgery done on Friday the 13th? She had a follow up appointment today. Her next and final follow up is in two weeks. The good news is the lab report showed no abnormalities in the mole. All the way home the Bug coughed and hacked until her right lung suddenly appeared in her hand. And to my horror she said she has had the cough for three weeks and I have done nothing about it. Um...I was supposed to take her to the doctor and I forgot. I've had a lot going on! My dad is getting divorced, is about to arrive on my door step with all his dirty laundry AND my water heater sprung a leak earlier in the week and is only temporarily fixed. I've had a full plate, alright!? I am inching further and further away from earning that "Mom of the Year" award. I guess it's okay to dump the folder where I've been storing and editing my acceptance speech. In June I sat down in Leslie's hair chair and said "I want Rockstar Bangs". She looked at me sketpically because I had just spent a year growing out the bangs I had previously had. They were not rockstar. They were just whispy bangs and I had grown tired of them. 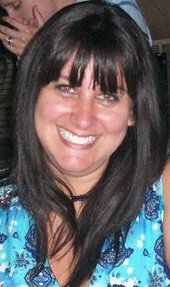 While it is much easier, without bangs, to gather up all my hair and throw it into a pony tail, the look just doesn't work for me anymore as a woman approaching her 4th decade of life. At Easter, my youngest sister was sporting a new hair style. Her long straight hair is naturally jet black and her bangs were rockin. They were full with a blunt cut. I immediately loved them. So I asked if she would be offended if I got my bangs cut the same way. She was not insulted. She was flattered. And she should be. She looked awesome. I wasn't trying to compete. I just loved the cut. These are Rockstar Bangs. And to prove my point, here are the pictures. 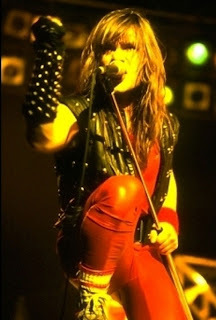 Bruce Dickinson, lead singer of Iron Maiden and Rock God. Joan Jett. When I was in the 4th grade, I aspired to be just like her. Joan eventually came out of the closet. I, however, am straight as an arrow. But I still wanted that hair. Lzzy Hale. She is by far my favorite (rock) female lead singer. This chick has the voice I always wished I had. And look at that hair. My rope does not swing on that side of the creek. But if it ever did, I would want to play in her creek. Me. I am not a Rockstar. But I have bangs like one. And a girl can dream.